Are you looking for a tastier way to eat your veggies? 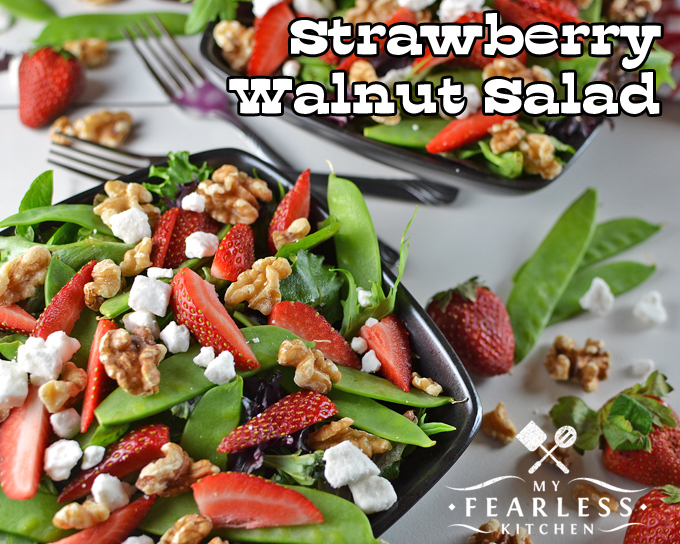 You can have this Strawberry Walnut Salad as a main course or a side dish. It will have you dreaming of spring all year long! We all know that salads are supposed to be good for us… but a big bowl of lettuce just doesn’t sound all that appetizing most days. 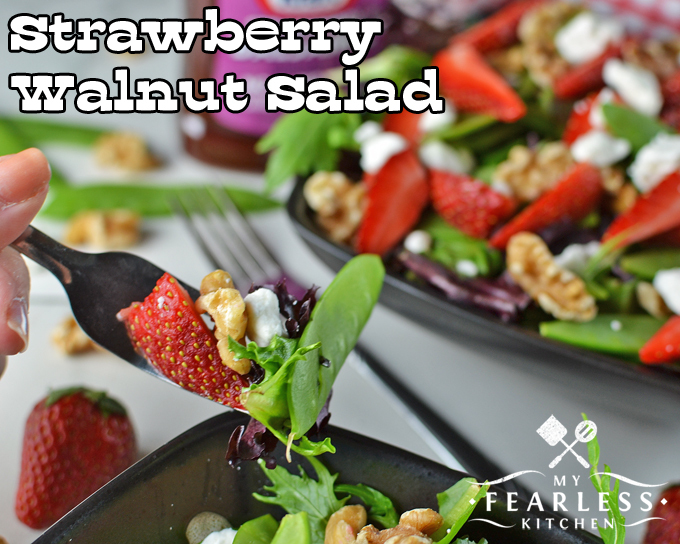 I like to experiment with different combinations to make salad fun, and this Strawberry Walnut Salad is delicious! Strawberries grow all over the United States. With the varied growing season across the country, you can find strawberries in season in your grocery store most of the year! (Florida’s strawberry season is December through April and California’s strawberry season is most of the year!) This salad is perfect to kick off the spring, to enjoy during the hot summer, or to make on a cold winter day to remind yourself that spring will come again. Iceberg lettuce and romaine lettuce are easy and classic, but they get boring sometimes. I grabbed a bag of spring mix salad greens. The pre-washed lettuce is great, because all you have to do is open the bag. No rinsing, no spinning, it’s just ready to go! I usually like snap peas in a salad like this, but my grocery store didn’t have any when I was getting ready to make this salad. I did find some snow peas instead, so I used them. They were tender, sweet, and delicious – the perfect match for the crunchy walnuts and tart feta cheese. Salad dressing is what makes a salad. There are so many flavors in this salad, you don’t want an overpowering salad dressing. You’ll want to go a little easy with the dressing so you can enjoy the strawberries, walnuts, and feta. This fruity and tangy Strawberry Balsamic Vinaigrette from Kraft was the perfect match for this springtime salad! Divide Spring Mix lettuce among 3 plates or large bowls. 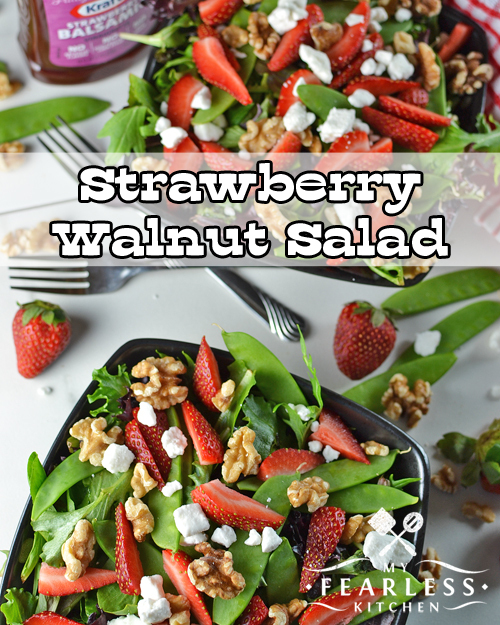 Top each salad plate with 2 Tablespoons Feta, 2 Tablespoons walnuts, ⅓ of the snow peas, and ⅓ of the strawberries. Top with extra Feta or walnuts, if desired. Drizzle with Strawberry Balsamic Vinaigrette salad dressing to taste. I love the combination for flavors in this salad! And I agree, I have actually been in a mixed lettuce bag mood lately because I was great bored with my regular lettuce. I can’t wait to try this salad out! Thanks for linking up to the Celebrate 365 Blog Party! Thanks, Val! This is such a fun summery salad!